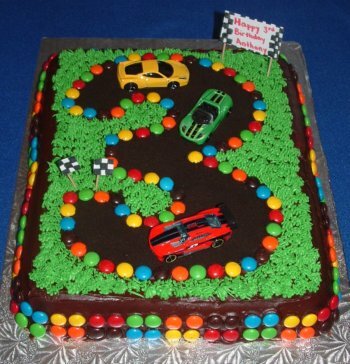 "This was a really fun Race Track Cake for a third birthday!" There are so many car cake designs and I wanted to make a special third birthday cake for my son. He loves cars, so I knew that I needed to make some type of car cake. His favorites are Disney Cars - so there was an option of making a Lighning McQueen cake, but his cousin had this cake before. His other favorite is Roary - so that would be a Roary the Racing Car cake. I decided to make this as simple as possible. I made a number three race track cake. 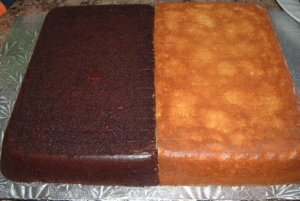 I made both a yellow and a chocolate cake. I made these cakes in a small casserole dish. This made the cakes nice and thick. I cut a small bit off one side of the cakes so they would fit perfectly together. I also levelled the cakes so they would be exactly the same height. I covered the cake with a layer of chocolate icing. 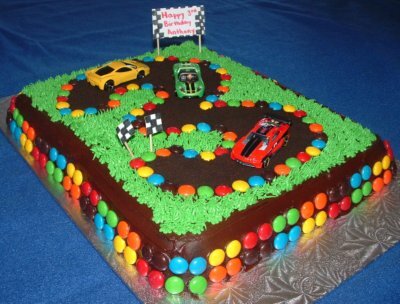 I made a pattern of M&Ms around the outside of the cake and around the race track. For the road of the race track I put Oreo cookie crumbs. I used vanilla icing for the grass and dyed it green using the Wilton Leaf Green. For the grass I used Wilton tip #233. I then made the flags and banner with paper, marker and tooth picks. I finished off the cake by placing three new cars on the track. 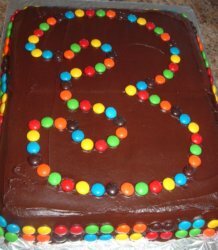 This third birthday cake was very special for my son. He just adored his race car cake!